We realize that our chambers and systems are critical facilities, especially in the manufacturing environment. Downtime cost money and disruption. We attack this problem by making sure our products are quality built and reliable. Our designs are time tested and we only use proven components and sub assemblies in production. In the case of our 6dof vibrators and vibration tables we are proud to be the only one in the industry to offer a full 3 year unconditional guarantee. Nonetheless, things will happen and Hanse is prepared to react quickly to provide timely product support in the field. We maintain critical spare parts and have solved many problems over the telephone. When it comes to knowing the ins and outs of your test equipment their is only one place to turn for a complete answer. We are always happy to help our customers understand their chambers and best uses for them. We want our customers to succeed in all that they do with our equipment. When looking for the latest software, manuals, and technical data look no further then our download section. When you need to find websites of our representatives, training company's and component manufactures. 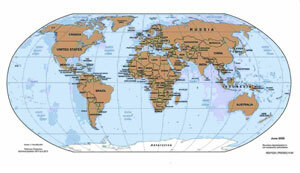 Our product support services are available worldwide.